I know like most of us we want to keep a family history and well we don't. Not because we don't want to but because we are so busy in life that things fall into the cracks. My sister gave me this book Called Family Fun Ideas for Family Home Evening vol.1 and in it was this great lesson about keeping a Family History and/or a Family Journal. They had an example of a Family newsletter that would act as your family home evening conducting sheet as well as a family history. So I took this idea and expanded on the news letter idea and added what I wanted for my family as well as a back side to the newsletter. The lesson also talked about everyone in the family filling it out so that they can express there views on the family happenings, as well as keeping a record of their handwriting. 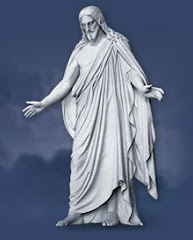 I was really excited about this because some of the advise that we get in the church is to keep a record of your family home evenings, like taking minutes, and recording your lessons. Well this is perfect for my family. Every FHE now we are talking about our activities for the week as well as recording them and we are talking about family goals as well as having a lesson. 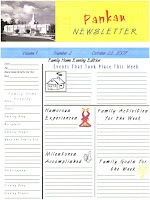 I am going to attach a picture of the newsletter that I designed for our family. I am eventually going to take the pages and have Kinko's or some place bind the pages and make books. I hope that my children will love this when they get older and love the memories that we record. I also hope that we as a family keep this great tool going for years. I love this idea. I think I am going to try to do it also. Thanks for having a great FHE blog. I hope you will keep updating your ideas.